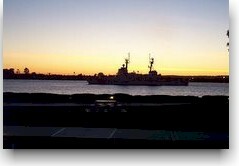 Headquartered on the waterfront across from San Diego International Airport, Coast Guard Sector San Diego is comprised of a dynamic mix of people and resources. Consisting of helicopters, small boats, cutters, aids to navigation, marine safety inspections and much more, Sector San Diego is responsible for Coast Guard operations from the Mexican border northward to above San Mateo Pt., and offshore as far as 200 miles. Under certain circumstances, search and rescue operations can even be extended into Mexican waters. Team Coast Guard in San Diego consists of 230 Active Duty, 150 Reservist, and 700 volunteer Auxiliary members.